An equalizer is probably the tool you use most while mixing and mastering, so you need the best of the best. With FabFilter Pro-Q 3, you get the highest possible sound quality and a gorgeous, innovative interface with unrivalled ease of use. 24 band dynamic EQ with Dynamic Range and Threshold controls and an intelligent Auto Threshold mode. Dynamic EQ bands still feature perfect analog EQ shape matching and also support Linear Phase mode. Surround support (up to 7.1.2 Dolby Atmos), with intelligent per-band speaker selection. Per-band mid/side or left/right processing options. New Brickwall LP/HP filter slope. New Flat Tilt filter shape. Improved spectrum analyzer with frequency collision indication and the option to show the spectrum of any other Pro-Q 3 instance. Improved Spectrum Grab with labels indicating the most important peaks. 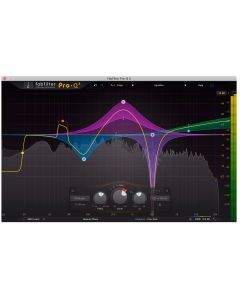 Improved EQ Match, adding the possibility to match with a post spectrum from another Pro-Q 3 instance in your session. Improved EQ band menu (also accessible via the value display), with Make Dynamic, Invert Gain options and more. Improved Auto Gain with channel weighting and an estimated correction of dynamic gain for a better overall gain adjustment.